I’ve unfortunately (or maybe not, since I was on vacation) missed the last two TWD postings but I’m hoping to come back strong with this Chocolate-Chestnut Tart. Don’t let my terrible photo (boo to winter afternoon lighting!) fool you, this tart is darn delicious. If I were in charge of cooking Christmas dinner, I’d be making it a second time this week. We’ve used Dorie’s Sweet Tart Dough many times by now, and here it’s filled with candied chestnuts and a rich, truffle-like baked chocolate filling. The chestnuts are candied during a long, slow poach in vanilla simple syrup. I was able to easily find vacuum packed chestnuts in a neighborhood gourmet store (I think I’ve even seen them at Trader Joe’s recently). I candied my entire package, which was more than the recipe called for. 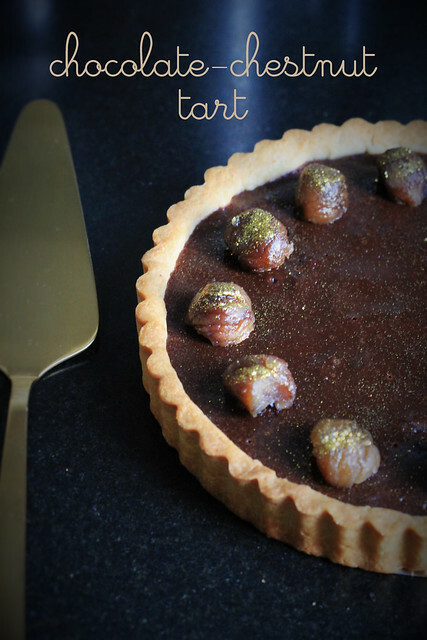 In addition to the sliced chestnuts hiding under the chocolate filling, I decorated the top of the tart with some of the extras, brushed with gold dust for a little holiday bling. Served with a scoop of ice cream and a drizzle of the awesome reduced chestnut poaching syrup, this was a fine way to end a meal. For the recipe, see Baking Chez Moi by Dorie Greenspan (it’s also here). Don’t forget to check out the rest of the TWD Blogroll. And happy holidays!! I hope you enjoyed your vacation. This is still a wonderful photo, very artistic. We loved this one too. Merry Christmas. Wasn’t the syrup just devine. Your tart looks amazing, and this recipe is a favourite of mine. This is a perfect tart for the holiday, quite impressive. Merry Christmas to you. WOW WOW WOW !! This is gorgeous. I am already cursing that I did not go to Trader Joe’s to get the chestnuts…now I am adding the “why don’t I have gold dust in my kitchen” to the mantra 🙂 Seriously, beautiful results that look like you would find in a patisserie. Happy Holidays !! One of my holiday favorites! Merry Christmas! I have found myself visiting your blog after quite some time. I was revisiting your DB challenge you hosted making puff pastry but have found myself salivating over your recent recipes. This chocolate tart looks amazing and I think I will have to try the brie in brioche for New Year’s celebrations. I will have to get my hands on Dorie’s cookbook. Happy New Year! Extra chestnuts sound like a great idea. Happy New Year! Gorgeous picture, actually. And yes, I am still thinking about that tart! I actually picked up more vacuum packed chestnuts “just in case”… I also thought about the gold dust on the chestnuts, but couldn’t find any locally. Ah well. Wow, the gold dust totally kicks it up a notch! Gorgeous photo! And can I ask which program you used to label your photo? I like it! Hi Margaret. Thanks– I use Photoshop for the text.